“Before the great recession, Harley-Davidson didn’t have to worry about counting the seconds,” writes The New York Times (Feb. 2, 2014). There was little competition for their core customers — “fat white guys,” as one employee called them. Harley charged a huge premium for its bikes, and its customers waited as long as 18 months to receive them. The union rep at Harley’s York plant said workers could assemble motorcycles at their own pace, music blaring. “We had 30% absenteeism every Monday and Friday,” added the plant manager. This all worked fine until the recession, when the company was close to collapse. Many firms respond to global competition by breaking their unions, by moving to a right-to-work state (or out of the country), and by employing robots on the assembly line. But Harley has an “American blue-collar, working man” brand, and to get rid of its union or to make its motorcycles in Mexico would have been catastrophic. The company could only compete by redesigning the production system so that each worker created more value than they cost. So Harley tore down the existing plant and built a new one. Unlike most factories, the new plant has people everywhere. 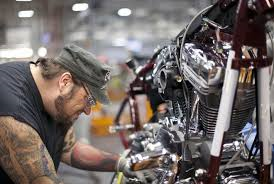 There are no robots on the main assembly line; instead, hundreds of workers, operating in teams of 5 or 6, manually build each motorcycle. There are around 1,200 different Harley configurations, and a new bike starts its way through the production line every 80 seconds. Virtually each one is unique. Human beings can also solve thorny problems that lead to major inefficiencies. At Harley, there are 150 “problem solvers” whose entire job is to continuously monitor their small sections of the production line and search for better ways to make motorcycles. The average tenure of a line worker at the York plant is 18 years, and these workers are extremely devoted to the company. (“How many factory workers have the company logo tattooed on their arm?” asks the plant manager.) Costs have fallen by $100 million at the plant and quality has improved even more significantly. Customer demand is extremely high, especially now that people can get a bike within a few weeks.